In early 1917, three small children were looking after a flock of sheep on a remote hillside when they saw a flash of lightning, and a blindingly bright lady sat in a tree. It was, of course, the Blessed Virgin Mary. Who else? After a quick chat, mostly about how the world should be dedicated to her memory, and how everybody should pray regularly, the BVM left with a promise to return. Over the next few months, she did so, always on the 13th of the month. By the last apparition, 70,000 witnesses were present. Fast forward a handful of years. Two of the children are dead, and the third has taken holy orders. Sounds like the beginning of a mediocre airport conspiracy theory novel, probably by Dan Brown, doesn’t it? Fast forward less than a century, to the present day. 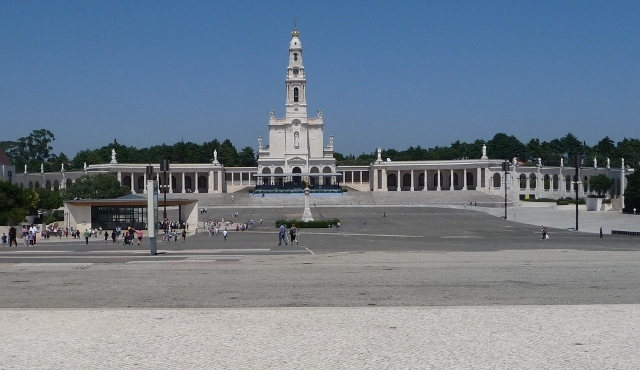 One of Portugal’s most revered religious sites has grown up here. Of a broadly similar layout to St Peter’s, Rome, but twice the size (capable of holding a million pilgrims), many of whom cross the square on their knees, it is an incredible sight – if slightly baffling to the non-believer. 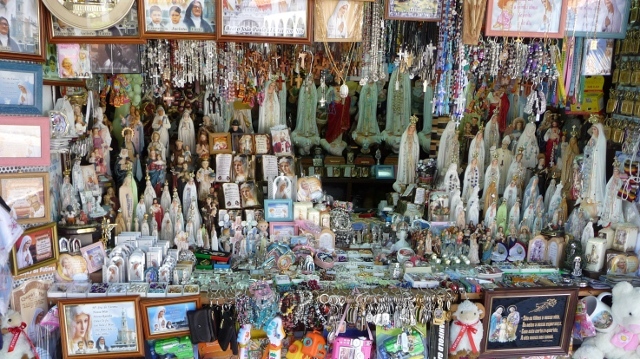 The rest of the town appears to only contain religious tat-shops – if you wanted a BVM table lamp, or a swirly-spangly-psychedelic wall clock depicting three children being apparated to, you’ve never had a wider choice. If you didn’t, your wallet will remain closed. Candles. Now, we all understand candles in a church or cathedral, don’t we? They’re small, like slightly over-grown tea-lights, and they’re sat on a nice little rack in front of a side chapel, where they flicker gently for a while. Not at Fatima. The candle stall in the Basilica square itself sells a variety of sizes – for €0.50 you can have a small subtle one. Only an inch or so thick and a foot long. For a couple of Euros, you can go up to something resembling a wax chair leg. But if you head in to town to the tat-shops… The most common super-candle appeared to be five foot long, but about an inch thick – but they go up to three or four inches diameter at that length. Or do you have something in particular you want to pray for? A child/grandchild? An ailment? No problem. Life-size wax feet are available. Or hands. Or entire limbs. Or children’s heads (several styles). Or, perhaps, a bosom. No, seriously. I promise you. So – we’ve got mahoosive candles, and a large and eager congregation. You can guess what’s coming, can’t you? Yes, it’s conflagration o’clock. The candles are lit and placed in racks in a building, open to the air. This is a good thing, because the candle racks resemble nothing more than an over-enthusiastically stoked barbecue. Heat floods out. 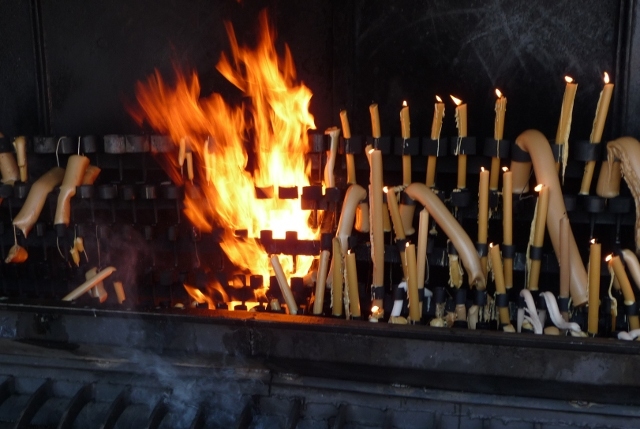 As a fairly predictable result, those thin tall candles quickly melt and wilt, causing more wax to fuel the raging furnace. Thick, acrid smoke (for those prices, you can guess that these are not high quality 100% beeswax) pours out. The floor is slick with wax. Oh, yes – and on the other side of the main square to the fire-pit, there’s a section of the Berlin Wall. No particular explanation of why. There just is. This entry was posted in Art & Culture stuff, By Country - Portugal. Bookmark the permalink. You’ve got my hopes up for christmas now! The latter would look lovely next to my Egyptian muezzin alarm clock. What a splendid post. I’ve great sympathy with your cynicism.